Oh, the Western look... pronounced in French like Luke. Anything from the Old West seems to be eternally a la mode here (in fashion)... The best explanation I've gotten for this fad is that in the 80s and 90s they used to run a lot of old classic Westerns on French TV on a program called La Dernière Séance (the last showing). The show was hosted by French singer Eddy Mitchell. Thanks to this series, John Wayne was and is still a hero here in France. This is one of those rolling billboards, where after about 15 seconds, the whole screen flips to the next advertisement. 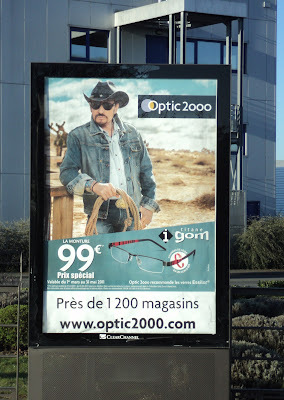 Our star here is 60s rocker Johnny Halliday, who along with his wife Laeticia, does many ads for this eyewear chain. Deux idôles des années 60... et toujours d'attaque en 2011... Quel cru !